(TB2QAA1) Look Twice Geocoin - Todie's Wild Ride: Pay Attention While Driving! Todie's Wild Ride: Pay Attention While Driving! Use TB2QAA1 to reference this item. To encourage everyone to pay more attention while driving. We're all guilty of being distracted while we drive. We talk on our cell phone, we look for a CD or play with the radio, women check their makeup, etc. We need to pay more attention while we drive so we can avoid causing or being in an accident. This coin is part of the Todie's Wild Ride race to help promote motorcycle safety. Please discover or move it, but don't keep it! This coin is being released in loving memory of Todie Phillips of Manitou Beach, Michigan--Tod of Team Rod and Tod w/KAboom...the Cachestalkers. Tod died in a tragic motorcycle accident on August 12, 2008 when a truck turned in front of him and he tried to avoid it. Sadly Tod was wearing a novelty helmet that wasn't DOT approved when he died. Thanks to WRITE SHOP ROBERT for giving us this coin. Gallery Images related to Todie's Wild Ride: Pay Attention While Driving! 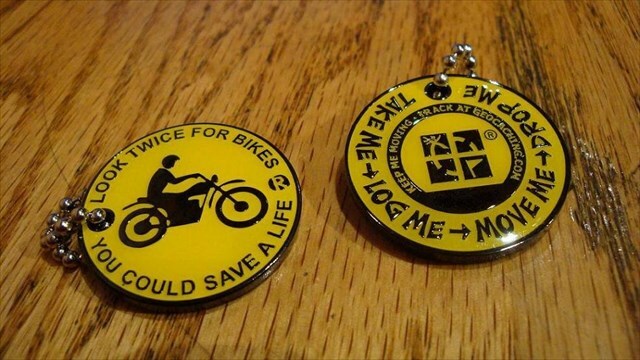 As a motorcycle enthusiast, Todie will be safe with me. After 1 micro 5 dnfs and a disabled cache I can only get half the tbs but one is you so happy travels. Grabbed it from Berkshire Geobash 3, will visit cache on log so that miles are logged. Such a sad thing when anyone is taken so early.